Diagnosing the allergic patient: a practical approach. 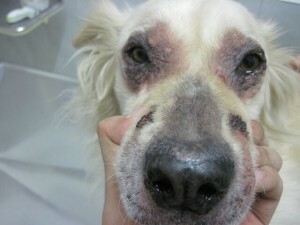 Allergic disease in animals and humans is a common condition. In dogs and cats is considered one of the main dermatosis affecting around 10% of the population. It is a pruritic, inflammatory, chronic disease with breed predisposition (1). Understanding the physiopathology and clinical characteristics is mandatory not only for the clinician, but the owner itself, due to the fact, most of the long-term treatment and management it is done by clinician-owner collaboration. First of all, one of the main characteristics we may find on an allergic patient is pruritus. Pruritus is defined as the unpleasant sensation that triggers the desire of itching, this may be manifested as chewing, biting, licking, scratching or rubbing in our patients; due to this manifestations the clinician must be aware that most owners will associate pruritus only with itching, by this matter, a correct approach for the clinical history should be done addressing this questions correctly to include most of the manifestations of pruritus. We must try to obtain a complete clinical history of the patient condition. The second step is to rule out the common causes of pruritus. Bacteria, yeast and scabies may enhance or be the main cause of pruritus in some patients, however, the first two, most of the time have an underlying cause. The clinician must use basic tools like skin scraping and cytology in order to detect secondary infection or scabies. Scabies may be a “tricky” condition; is capable of emulate perfectly clinical signs associated with allergic disease, leading to a misdiagnosis and even to therapeutic mistakes. A negative skin scraping is not guarantee of absence of the Sarcoptes mite, by the other way, the chances of finding the mite or its ova are around 30% performing a correct superficial skin scraping technique. Some tips we may use in order to detect scabies are: low response or non-response of pruritus to corticosteroids, positive pinnal-podal reflex, and ear margin affectation. Allergic patients respond fairly well to corticosteroids administration, being one of the most used therapies for short and middle management of pruritus. Its use must be concomitant to cautions by the clinician about side effects. Nevertheless, patients with scabies normally have a poor respond to corticosteroids. The clinician must be aware of the existence of secondary infections by bacteria or yeast, due to the fact they are able to exacerbate itch. Pinnal podal reflex is obtained by vigorously rubbing the tip of one earflap on to the base of the ear for five seconds, and it is considered positive if the ipsilateral hind leg made a scratching movement. On a recent study the specificity of testing for scabies by the pinnal-pedal scratch reflex was 93.8 per cent, and the sensitivity was 81.8 per cent (2). This test is not pathognomonic for Scabies, however is really helpful in determining if we need to establish a therapeutic trial to diagnose scabies. 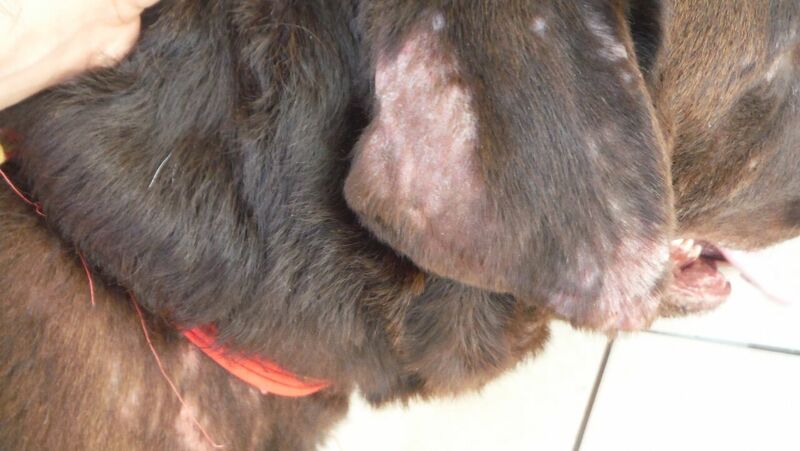 In the same study ear margin affectation was evaluated 73% of the dogs with scabies had pinnal dermatitis. 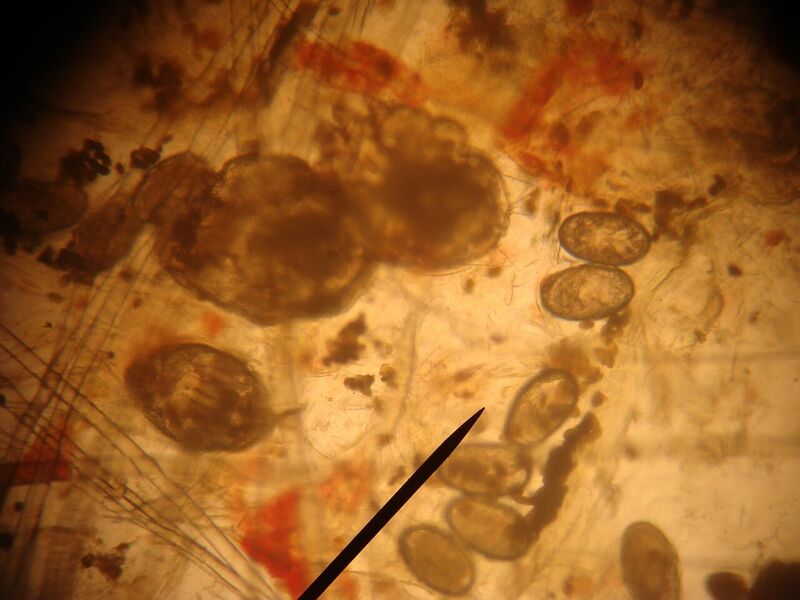 Crust or desquamation of the ear margin is characteristic of scabies in some pruritic patients. 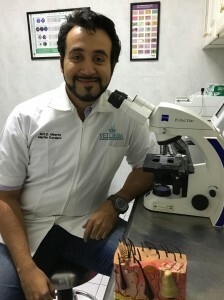 Therapeutic trial in scabies is referred to the administration of therapy for scabies and observation of diminish of the clinical signs to confirm the disease. Once scabies have been ruled out, secondary infections by bacteria or yeast must be eradicated using the respective therapy. Cytology must be performed on the affected areas of the allergic patients in order to detect microorganisms. Clinical signs of allergic disease. 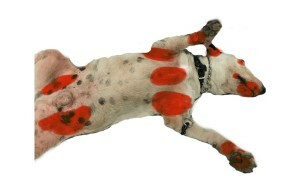 Dogs and cats manifest differently clinical signs related to allergy. Differentiating a patient with food allergy or atopic dermatitis only with clinical manifestations is not an exact or easy task. Dogs and cats with food allergy or environmental components of allergy react the same and may have the exact pattern of lesions. 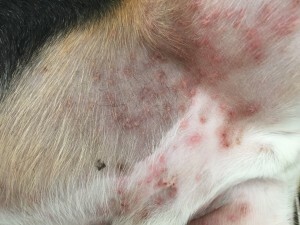 Lesions normally occurring in allergic dogs are: papules, pustules and epidermal collarets characteristics of secondary bacterial infection; ear disease: pinnal erythema, otitis externa; erythema of: periocular region, axilla, ventral neck, chest, flexor surface of the elbow, interdigital areas, inguinal region, perianal region (3). 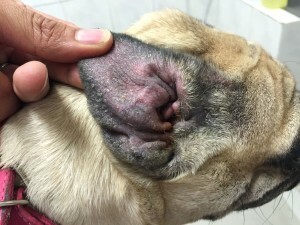 If we carefully perform and examination of the ear canal we may find mild clinical signs of allergic ear disease as react of the ear canal glands, erythema or mild inflammation of the ear canal. The author recommends exploring the ears on all patients suspicious of allergic disease. Flea allergic dermatitis or a flea component in the allergic patient may show clinical sign on the dorsolumbar region; and in some cases, flea feces “flea dirt” or the flea itself may be found. 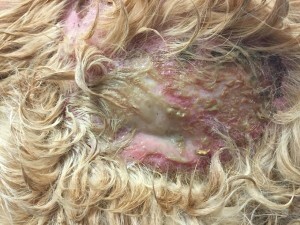 Some patients may develop moist acute dermatitis “hot spots” on the lateral aspect of the head (this may be related with otitis externa) or in the dorsolumbar region (related to flea allergy); however, we must recall that moist acute dermatitis is not solely related to allergic disease. 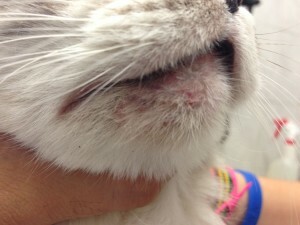 Cats may be develop any of the eosinophilic granuloma complex lesions as well as military dermatitis, feline acne, excoriations of the neck and on the back of the head, alopecia by excessive grooming. Secondary bacterial infections are not common in cats as in dogs. Otitis externa in the allergic patient. Otitis externa is defined as the inflammation and subsequent infection of the external ear canal. The causes and factors of otitis externa may be divided in 4 according to a classification proposed by Griffin. Predisposing, primary, secondary and perpetuating factors of otitis externa is the most accepted classification at this moment and is currently used by the author in patient classification. 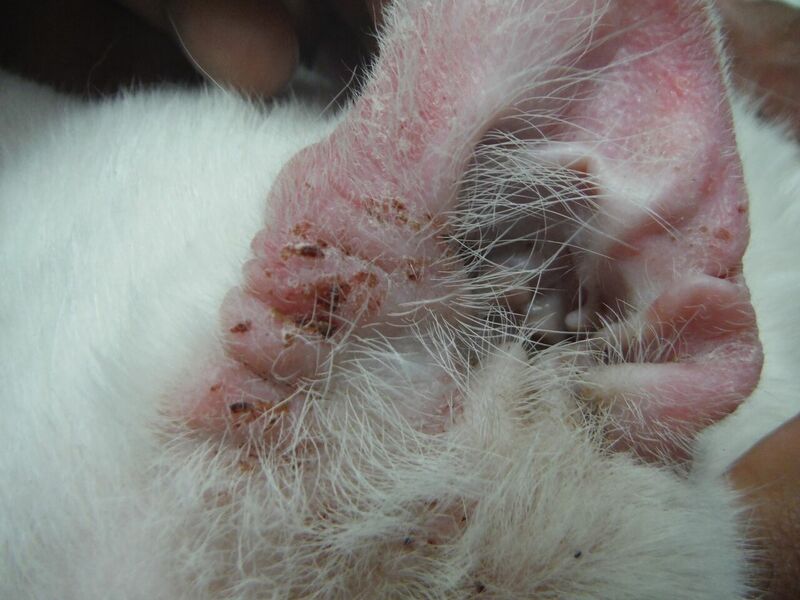 Predisposing factors include: anatomical characteristics of the ear canal, such as hairy or stenotic ears, excessive moisture, and overtreatment with ear cleaners or swabs. Primary factors include allergies, keratinization disorders, autoimmune and immune mediated conditions, endocrine diseases, and foreign bodies. Being allergy one of the main causes for recurrent otitis externa especially in dogs (4). Secondary factors are related to bacteria or yeast infection. Perpetuating factors normally are related to chronic pathological changes of the structure of the ear canal as well as complications within the middle ear. Pruritus level must be evaluated in allergic patients, a visual analogue score published by Hill et al., allows owner to effectively assess pruritus using a scale form 0 to 10 (5). This scale may be used at the rechecks or during the administration of allergen specific immunotherapy. Establishing allergic components in the patient. 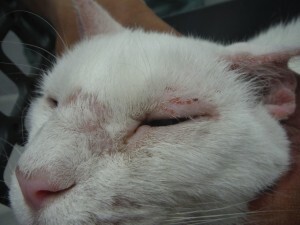 Allergic patient may have an environmental component, food component or flea allergic dermatitis. We must resist temptation to separate allergic diseases in all this major three allowing a patient to be diagnosed as “allergic”. Our diagnostic goal is to identify the allergenic components in the patient, being aeroallergens, food ingredients, flea or insects; separate or altogether in order to create a control plan for each individual (7). Patients with non-seasonal pruritus must be suspicious for food allergy, especially if the have gastrointestinal signs present. Questions like number of bowel movements, form of the feces, gases and increase of intestinal noises should be asked to owners. A recent study was able to determine the average number of bowel movements per day as 1 to 3 in 96% of the dogs of the study (8). A correct restrictive diet must be performed in non-seasonal pruritic patients in order to confirm or rule out food allergy. The average length of the food trial is for 6 to 8 weeks (9). During this time, clinician must use hydrolyzed diet, novel protein diet or home cooked restrictive diet with limited ingredients. Hydrolyzed proteins are composed by proteins chemically and physically “broken” in small particles. The smaller the allergen, smaller the capability of the IgE to catch this proteins even if the y are allergic to them. Prescription hydrolyzed diets claim a protein size from 3,500 to 10000 Daltons; novel diets mainly composed by amino acid ingredients claim a size lower than 1000 Daltons. Some studies have evaluated that up to 21% of patients with food allergy may react to hydrolyzed proteins (10). The principle of using a novel protein diet is to administer ingredients to which have never be exposed before. The problem with “novel proteins” especially in over the counter pet foods are that the novel ingredients shown are only part of the ingredients contained and common ingredients in pet foods are generally used as additives. The clinician must advise pet owner to read all the ingredients in the dog food in order to avoid previously ingested ingredients. Even tough, another problem is secondary contaminants particles that may be found in “selective ingredients” pet foods as a result of the manufacturing process. A recent study evaluated secondary contamination by PCR and microscopically analysis of several commercial diets used on food trials (11). Home cooked diets with limited ingredients seem, to be the best choice to perform a food trial, however, owner availability to cook for their pets, acceptance by the patient or choose of the correct ingredients are important factors to consider before prescribing this choice. A good, low hydrolyzed prescription diet with small particle size is commonly the best choice to diagnose food allergy in dogs and cats. Pruritus may be controlled the first couple of weeks of the food trials to avoid further injures using shot term pruritic management as short length corticosteroids or oclacitinib to diminish the initial clinical signs. Anti pruritic therapy should be discontinued in order to correctly evaluate the response to the restrictive diet. During the food trial, owner and clinician will observe one of three manifestations: absence, diminish or continuation of pruritus. An absence of pruritus should be continued with a re exposure to the previous ingredients or pet food ingested by the patient, and during the first week, clinical signs must re appear confirming the diagnosis of food allergy. 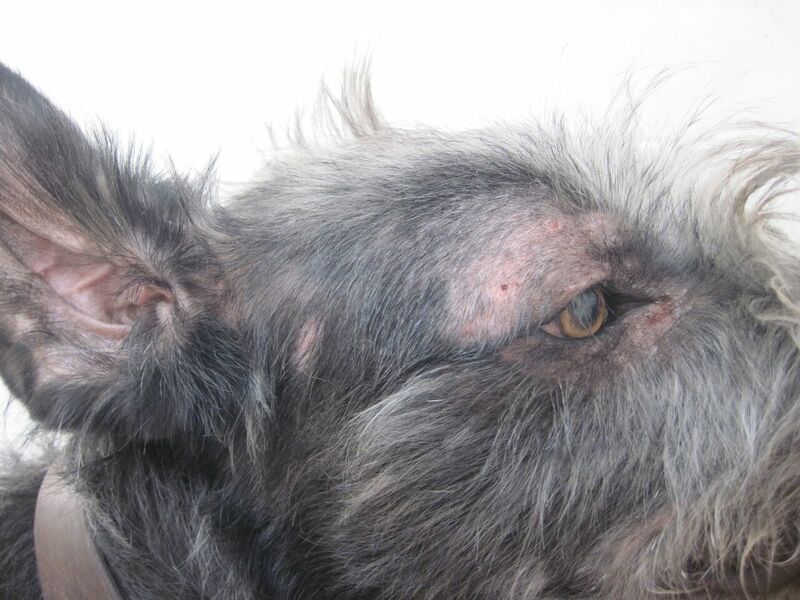 Diminish of pruritus must be addressed as previously stated with a re challenge to pet food, however, in this case, possibility of aeroallergens reaction must be suspected. The patient could be diagnosed as a patient with atopic dermatitis with a food allergy component. Continuation of clinical signs after or during the food trial could lead us in the direction where no food allergy exist, but aero allergens and insect allergen may be the primary allergenic cause in the patient. Re challenge to previous diets is not needed on this case. 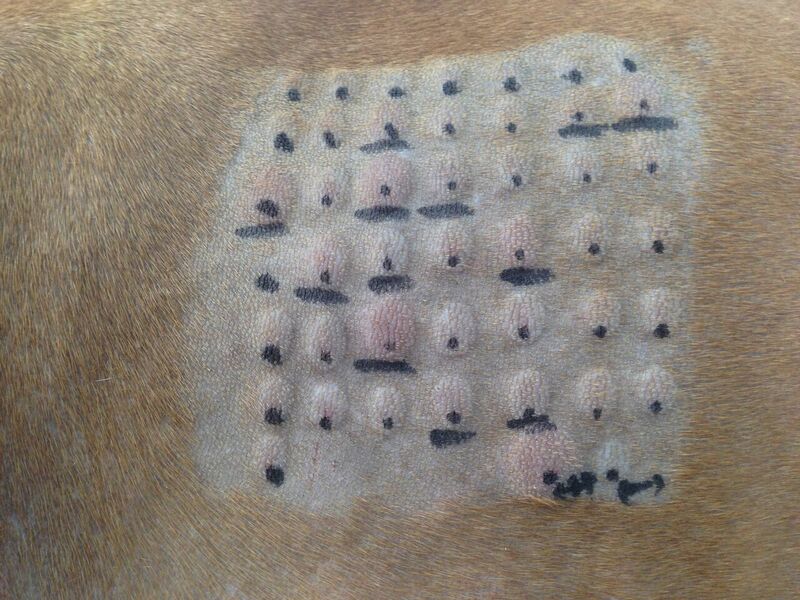 Allergy testing is reserved for the elaboration of allergen specific immunotherapy, an effective treatment for hyposensitize patients with environmental allergies. 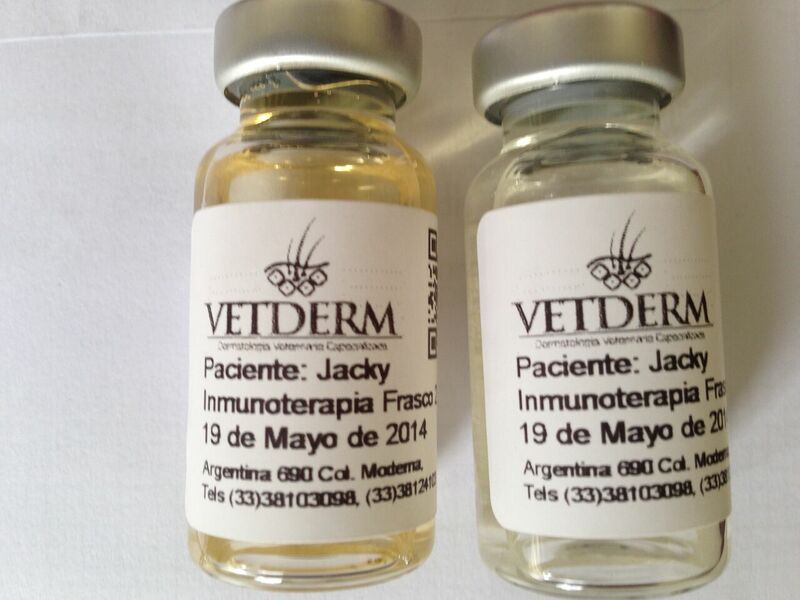 This test may be performed by intradermal application of allergens as well as measuring specific IgE in serum. Allergy testing should not be used with the purpose of diagnosing a patient with canine atopic dermatitis, must be strictly reserved for the elaboration of “allergy vaccines”, that are mixtures of allergens to which the patient is reactive and are applied with increasing concentrations in order to decrease future sensitization. A short term, middle and long-term control management for the patient with environmental allergies must be created once we rule out other allergies and pruritic causes (11). 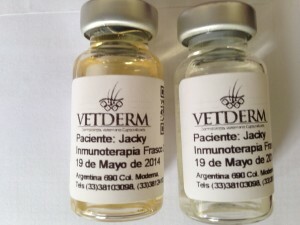 Short-term control of pruritus with topical or systemic corticosteroids, or oclacitinib administration. Topical therapy with moisturizing and epidermal barrier improvement shampoos. Hillier, A., & Griffin, C. E. (2001). 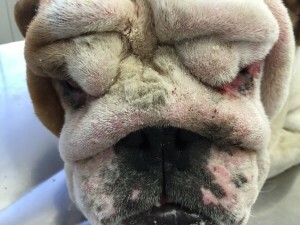 The ACVD task force on canine atopic dermatitis (I): incidence and prevalence. Veterinary Immunology and Immunopathology, 81(3-4), 147–151. Griffin, C. E., & DeBoer, D. J. (2001). The ACVD task force on canine atopic dermatitis (XIV): clinical manifestations of canine atopic dermatitis. Veterinary Immunology and Immunopathology, 81(3-4), 255–269. Saridomichelakis, M. N., Farmaki, R., & al, E. (2007). 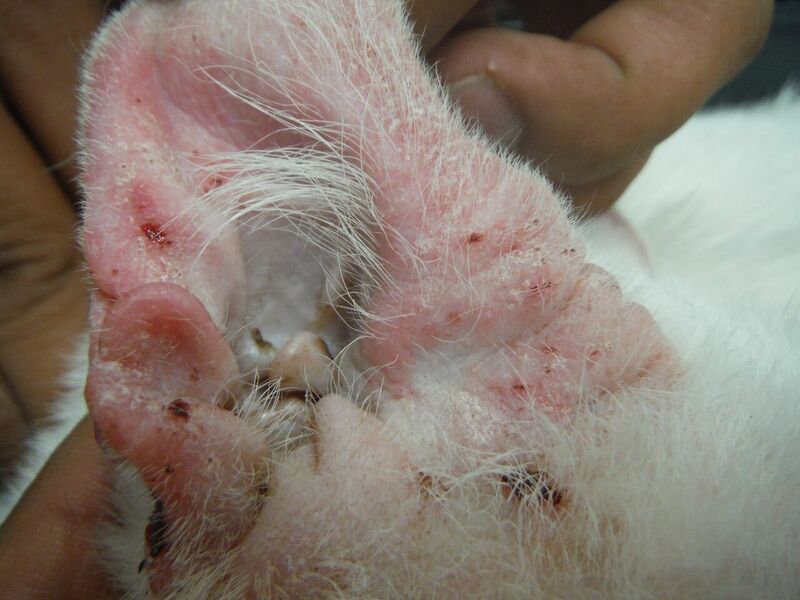 Aetiology of canine otitis externa: a retrospective study of 100 cases. 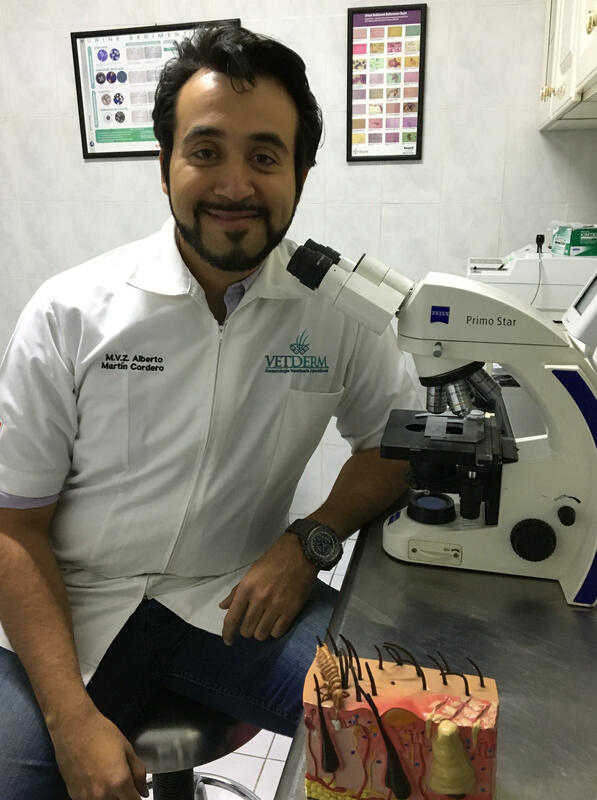 Veterinary …. Rybníček, J., Lau-Gillard, P. J., Harvey, R., & Hill, P. B. (2009). 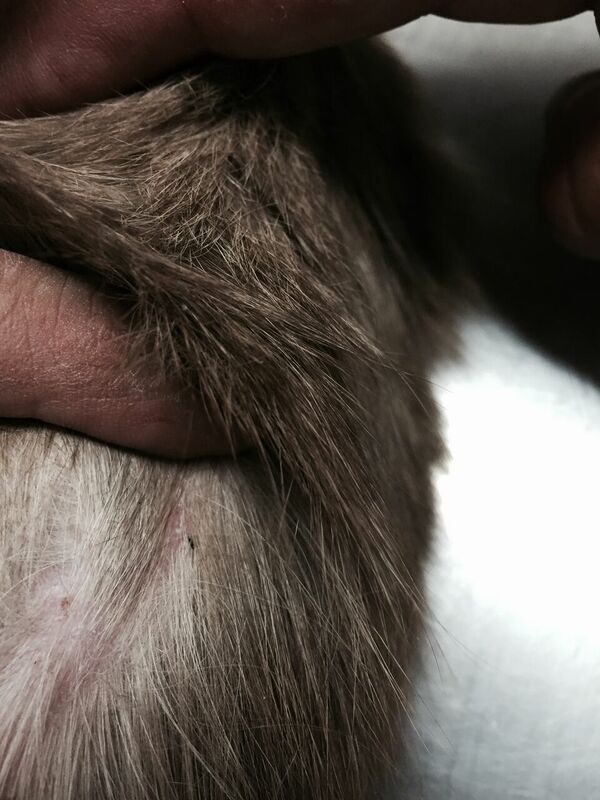 Further validation of a pruritus severity scale for use in dogs. Veterinary Dermatology, 20(2), 115–122. Favrot, C., Steffan, J., Seewald, W., & Picco, F. (2010). 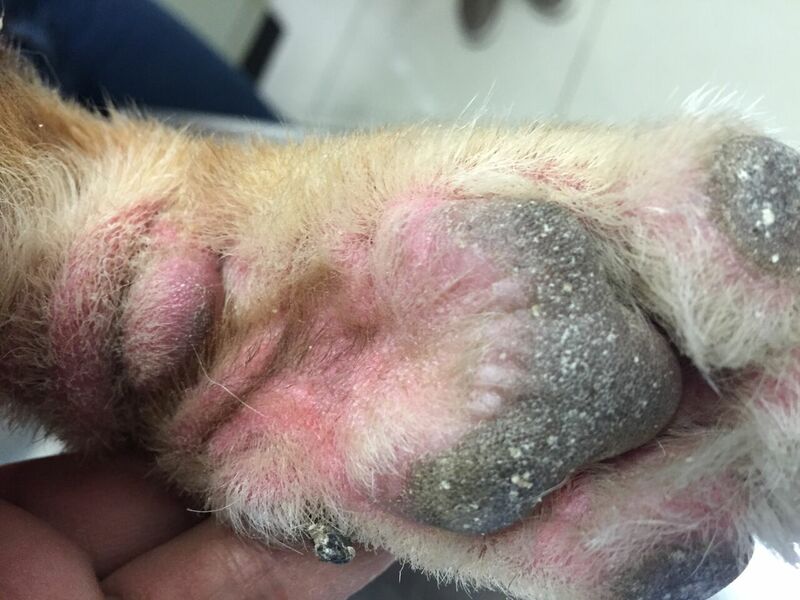 A prospective study on the clinical features of chronic canine atopic dermatitis and its diagnosis. Veterinary Dermatology, 21(1), 23–31. Hensel, P., Santoro, D., Favrot, C., Hill, P., & Griffin, C. (2015). 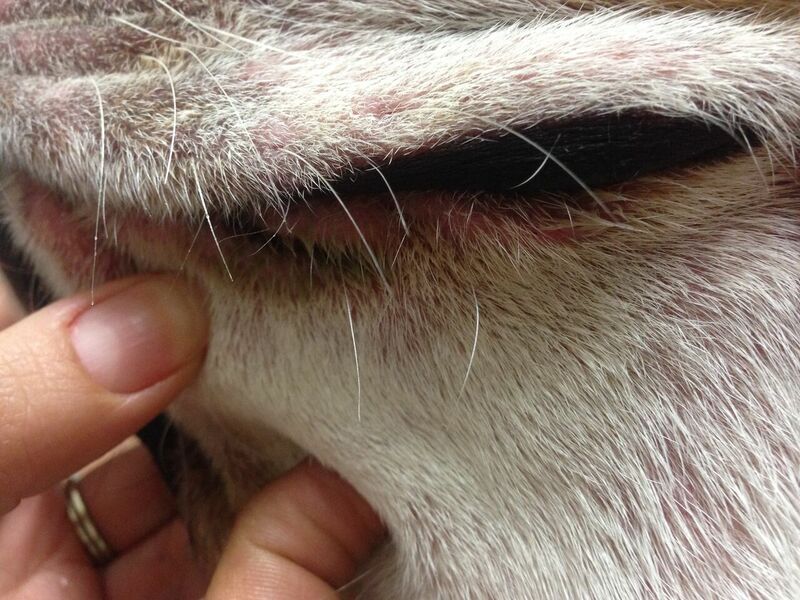 Canine atopic dermatitis: detailed guidelines for diagnosis and allergen identification. 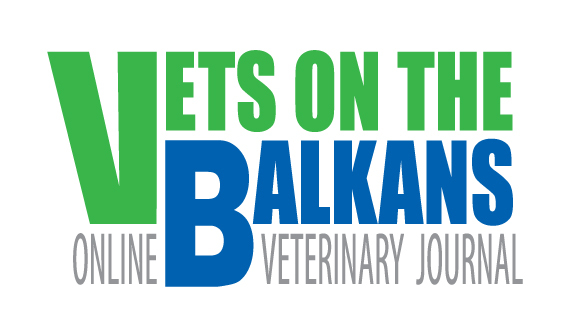 BMC Veterinary Research, 11(1), 1–13. Stetina, K. M., Marks, S. L., & Griffin, C. E. (2015). 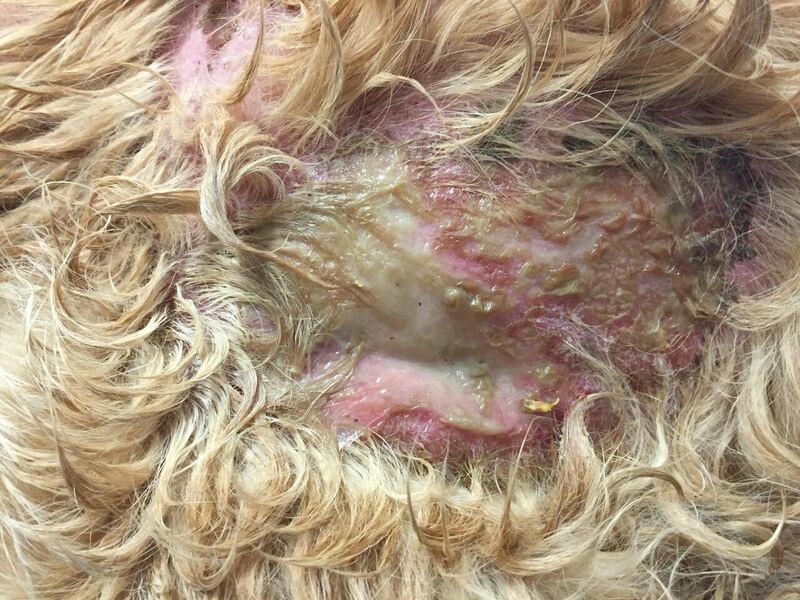 Owner assessment of pruritus and gastrointestinal signs in apparently healthy dogs with no history of cutaneous or noncutaneous disease. Veterinary Dermatology, 26(4), 246–e54.